Lot 974, a Siyouni filly who sold to Shadwell Estates for 450,000 guineas (US $276,935) at the Tattersalls October yearling sale. 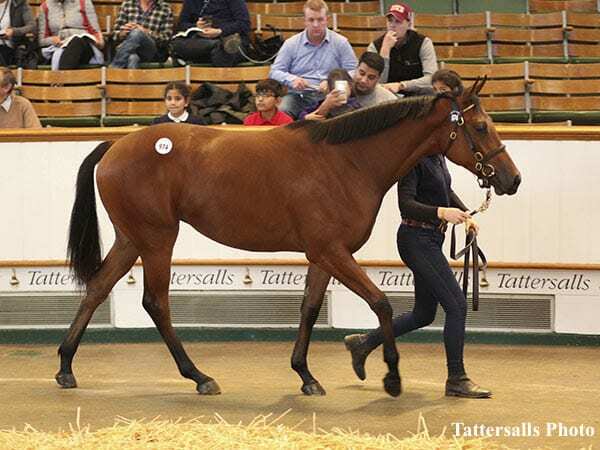 Book 2 of the Tattersalls October Yearling Sale continued in robust fashion on the second day with 18 lots selling for 200,000 guineas (US $276,935) or more. The turnover and average were both up on the corresponding session last year with the clearance rate remaining at a solid 86 percent. David & Henrietta Egan's Corduff Stud enjoyed a spectacular result when their Siyouni filly out of the Desert Style mare Brynica was sold to Shadwell Estates for 450,000 guineas ($623,086) after he saw off the efforts of Juddmonte Farms' Lord Grimthorpe and agent Stephen Hillen. The dam Brynica is a half-sister to the Group 1 Prix du Jockey Club third Baraan and to Bruxcalina, dam of the Group 1 British Champion Sprint winner Librisa Breeze. “We bought her dam at auction from the Aga Khan's draft on the advice of Blandford Bloodstock,” said David Egan of Corduff Stud. “She is from an original Lagardere family. “We knew the filly today had lots of interest and she was making lists, but it is very difficult to value them to that. Purchaser Angus Gold of Shadwell Estates said: “Sheikh Hamdan was very keen to buy fillies this week, and she was on the list very early on. She is a very nice filly with a great attitude – her ears were pricked the whole time. Book 2 of the Tattersalls October Yearling Sale continues Wednesday, Oct. 17th with the third and final session. This entry was posted in Bloodstock and tagged Angus Gold, Brynica, Corduff Stud, David Egan, horse auctions, Shadwell Estates, Siyouni, tattersalls october yearling sale by Edited Press Release. Bookmark the permalink.